The Kalvari submarine started harbour trials in Mumbai this month. Suddenly, there seems to be a lot of movement on the submarine front. Submarines are of two types: conventional and nuclear. During his recent visit to Russia, Defence Minister Manohar Parrikar is reported to have discussed the lease of an Akula class nuclear submarine to India. Meanwhile, the Kalvari submarine started harbour trials in Mumbai this month. Suddenly, there seems to be a lot of movement on the submarine front. Submarines are of two types: conventional and nuclear. Conventional submarines (SSK) use a diesel-electric engine as their power source, and have to surface daily to get oxygen for fuel combustion. Nuclear submarines are powered by a nuclear reactor, and they can continue to function submerged for months without having to surface. The nuclear powered attack submarines (SSN) are different from those that carry ballistic missiles with nuclear warheads (SSBN) — the latter have a bigger size and more stealth features. Capable of staying underwater undetected for long periods, SSBNs are supposed to be the best guarantor of a second strike capability in a nuclear exchange. But the SSKs score over the SSNs and SSBNs in littoral waters where effectiveness in relatively shallow water is a critical requirement. SSKs are optimised for stealth, and their weapons and sensors provide for effective operations close to the shore, both in offensive and defensive roles. A navy thus needs a mix of SSKs, SSNs and SSBNs in its fleet. A force level of three to five SSBNs, six SSNs and 20 SSKs is required for the Indian Navy to fulfill its mandate of a blue water navy. The guiding principle of submarines is to have one on patrol, one on transit to patrol and one in harbour for maintenance. For adequate strategic deterrence, one SSBN should be underwater at any given time, needing a minimum of three SSBNs in the fleet. The three aircraft carrier battle groups, as envisaged for potent force projection and expeditionary capacity, will need two SSNs each. Assuming a 60 per cent operational availability, 12 out of 20 SSKs will be available for both the coasts, the minimum required for India to maintain a credible tactical and operational presence in the littoral. 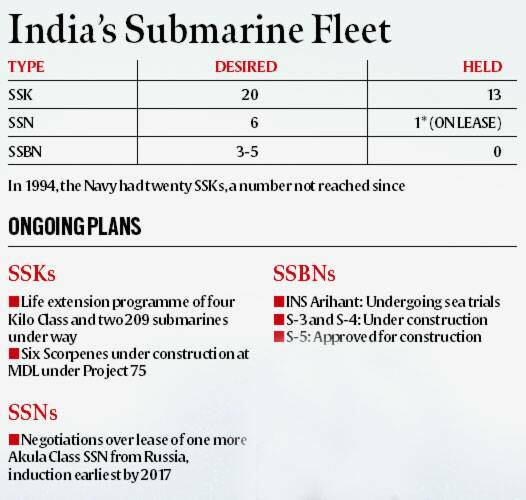 The Navy currently has no SSBNs — under construction INS Arihant is undergoing sea trials — and one SSN, a Russian Akula class submarine taken on lease in 2012 for 10 years. The Navy has only 13 SSKs: nine Sindhughosh class (Russian Kilo class) and four Shishumar class (German Type 209) submarines. The first eight Sindhughosh class SSKs were acquired from the Soviet Union between 1986 and 1991, while the ninth and tenth were acquired from Russia in 1999 and 2000 respectively. The tenth submarine, INS Sindhushastra was the first Indian submarine to be fitted with the Torpedo Tube launched anti-ship Klub missile. The ninth submarine, INS Sindhurakshak, was lost in an accident in Mumbai in 2013. The first two of the four Shishumar class submarines were acquired from HDW in Germany in 1986. The remaining two were built in India under licence at Mazagon Docks Ltd, Mumbai: INS Shalki in 1992 and INS Shankul in 1994. The saga of India’s submarine acquisition has been one of fits and starts, resulting in the waxing and waning of capability. In 1957, the Defence Minister requested Lord Mountbatten, then the First Sea Lord, to provide India a target submarine which could be the oldest and cheapest available. It didn’t materialize. In 1959, the Navy asked the UK for three operational submarines, but it refused the soft credit terms sought by India. The Navy’s submarine arm finally came into being on 8 December 1967 with the commissioning of INS Kalvari, a Foxtrot class (Type 641) submarine, at Riga in the Soviet Union. Eight submarines were acquired from the Soviet Union between 1967 and 1974 — four till 1969, which participated in the 1971 Indo-Pak war. All of them have been decommissioned now. The Navy first gained experience in operating technologically complex nuclear submarines when it leased a Charlie-I class SSN from the Soviet Union between 1988 and 1991. In 2006, India and Russia signed an MoU for the lease of two Akula class SSNs for a period of 10 years. India got the first one in 2012, and if Parrikar’s negotiations succeed, the second one could reach India by 2017. India’s indigenously built SSBN, INS Arihant is undergoing sea trials, following which it will be inducted into service. Two other SSBNs, S-3 and S-4, are under construction now, and plans for a much bigger S-5 submarine have also been approved. When it comes to conventional submarines, the Navy’s problems are not due to lack of a plan. A ‘30-Year Plan for Indigenous Submarine Construction’ was approved by the Cabinet Committee on Security in early 1999. This plan envisaged the development of two production lines on which six submarines apiece — christened Project 75 and Project 75 (I) — would be built in collaboration with two separate foreign submarine builders. The Navy would, in the meantime, develop an indigenous submarine design which would then produce 12 SSKs on these two production lines. By 2030, the Navy would then have about 24 modern SSKs. The six Scorpene submarines being made at MDL are under Project 75 — INS Kalvari which went for harbour trials recently is the first one, and will be inducted by 2017. The balance five will then be inducted by 2021. No contracts were issued under Project 75 (I), which was amended in 2010 by the DAC to allow two SSKs to be purchased on outright basis, and four to be made in India. This was done under pressure from the then Navy chief, considering the alarming state of SSKs. Late last year, the DAC chaired by Parrikar reverted to the original plan with all six 75(I) being produced under Make in India. A committee formed to examine the existing shipyards and shortlist them submitted its report in eight weeks but no decision has been taken so far. Furthermore, the 12 indigenous SSKs to be produced under the second phase of the 30 year plan have been amended to six SSKs and six SSNs in a decision taken this year by the DAC. 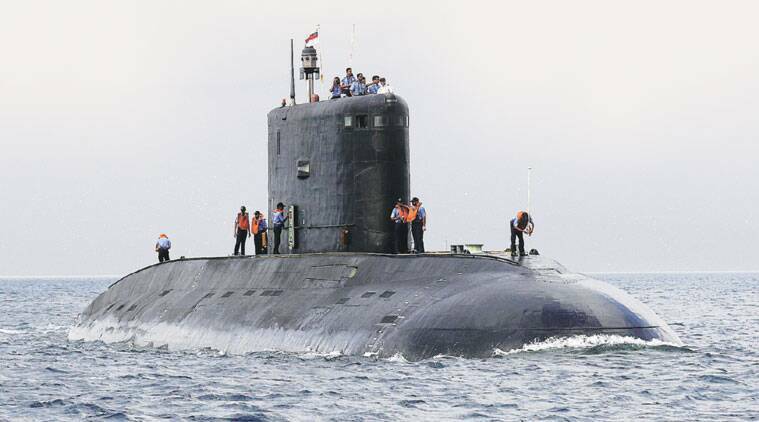 With only 13 SSKs in its fleet, and 10 of them of pre-1990 vintage, the government has decided to go for a refit of four Sindhughosh and two Shishumar submarines to extend their life. Even with extended life, the SSKs will suffer from performance degradation during operations. India’s maritime neighbourhood has navies with increasing submarine and anti-submarine warfare capabilities. China currently has 5 SSNs, 4 SSBNs and 53 SSKs, while Pakistan is acquiring 8 submarines from China.